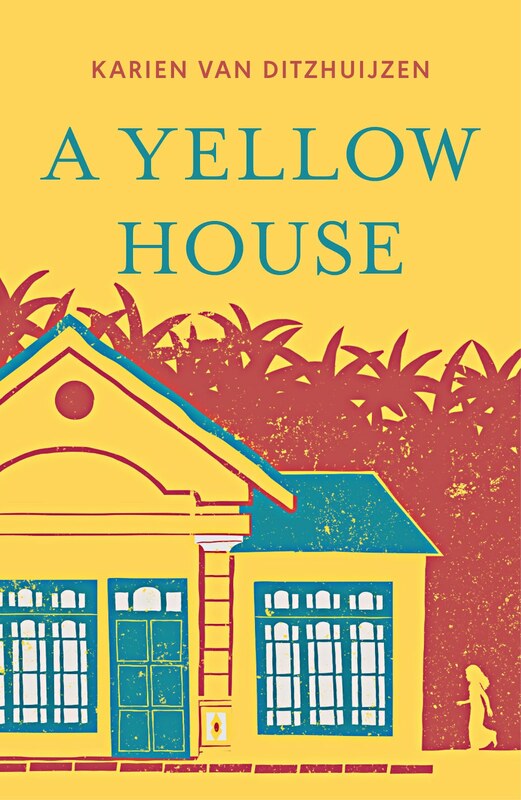 The yellowish blob was hanging on the edge of the pool, just above the surface, resembling a ball of construction foam – you know, the stuff you squirt from a can. I figured the builders left it there. When I pulled it off, and threw it in the garden, its soft squishiness surprised me. Maybe the chlorine water had rendered it so soft? When we saw another one the next day, I pinched myself. Surely that had not been there before? I scraped it off carefully, and examined it more closely. On the inside of the spongy grey-yellow foam, there were little white balls. Some kind of eggs? It took a bit of effort on Google to figure out his was the egg mass of the four lined tree frog. The kids got used to our daily blobs, and we had to set rules, no throwing, and no putting them down your sister’s swimsuits. Once, we must have missed a blob, and the pool was full of tiny tadpoles. The children spend a morning painstakingly catching every single one with their hands, and collecting them in the pail where we were hatching some blobs already. 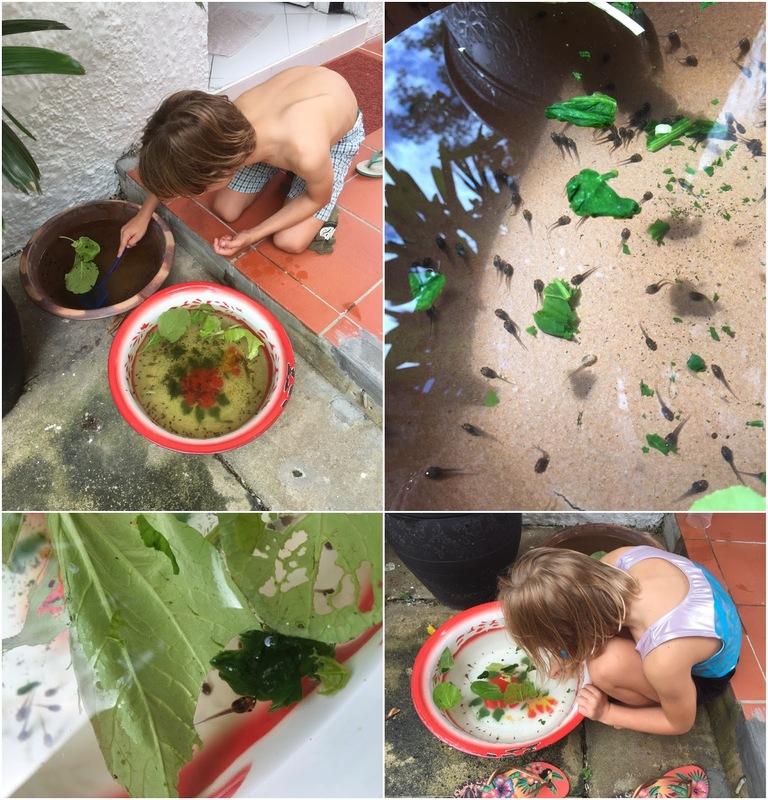 We had tadpoles aplenty; we were now running a frog farm. The tadpoles thrive on chye sim and spinach, and it did not take long before the first legs appeared. As soon as they could crawl, they would jump out of the pail, and join their friends in the trees. Worried about being inundated by tree frogs, we had to find a solution for our little swimmers. Since I found out that our hens loved snapping up these swimming wormlike creatures, I skim the pail regularly to avoid tadpole excesses. Extra protein is always good for our egg layers. 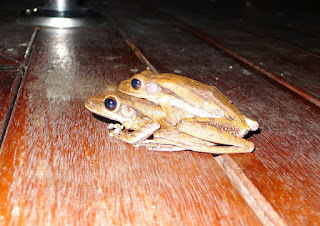 We love our frogs, a friendly, albeit nocturnally noisy addition to our Adam Park Farm. Awesome post K! I'm glad they weren't toads..